Leesfield Scolaro, P.A. has been consistently recognized as one of the leading trial law firms in the nation, and our trial lawyers rank among the top attorneys in Florida and nationwide. We represent individuals and families who have suffered serious injury or the loss of a loved one due to the fault, carelessness, and negligence of others. For almost forty years, Leesfield Scolaro has fought for its clients in the courtrooms in Florida and across the country. Recognitions include The Best Lawyers in America, Florida Legal Elite, South Florida Legal Guide Top Firm and Top Lawyers, South Florida Business Journal Key Partners Award, and Super Lawyers. For a list of the firm's representative verdicts and settlements, please visit our Verdicts and Settlements section. Our firm has a reputation for taking on challenging cases, and aggressively representing our clients. We have the resources, skills, and experience to take on any individual or corporation, frequently handling cases against powerful interests and big business. The majority of our clients come to us through other attorneys and past clients. We pride ourselves on being considered the Florida Connection for attorneys throughout the country who have family, friends, and clients who have suffered injuries or the loss of a loved one in Florida. 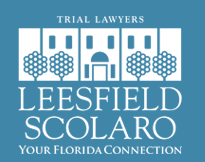 Please see our Referral Attorney Network Section to hear what some of our referral attorneys have to say about Leesfield Scolaro.